This entry was posted on June 28, 2010 at 10:15 pm and is filed under Uncategorized. You can follow any responses to this entry through the RSS 2.0 feed. You can leave a response, or trackback from your own site. I do like the new tags, but I do have one point. I think you will have to be very careful that they don’t become ‘hard-edged’ IYKWIM. The font in B&W looks hard and in turn a little unfriendly. The typewriter font is round and softer edged. I doo like that one, so I am glad you would be keeping it at least in some respects! 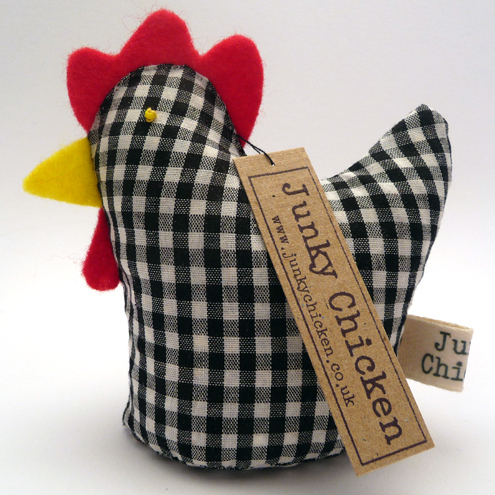 Try having some of the Newsprint lettering on ‘Junky Chicken’ as an outline. Maybe that would lighten it a little then it would be less hard. I think I know what you mean about the ‘hard-edged’ness and it maybe seeming a little unfriendly was what we were worried about. I will have a play around some more and see if I can make it a bit friendlier! I will definitely be using the typewriter font still as I do love it. I love your old font so I think I would have to look at your new one for a while. I have chosen a new font too so and I spent hours looking at fonts, I never knew there were so many as before I had only really used the ones on Word. But I do think the new font suits your shop. It is amazing how many different fonts there are! I was surprised at how many ransom note style fonts there are and that’s just one kind! I’m glad you think it suits my shop 🙂 I’m aiming for branding that really makes it obvious at a glance that I work with recycled materials, as far as that is possible anyway! i really like the banners and the font for the tag but i like mixing up fonts and the messy look – if it was me i’d choose a slightly bigger “J” but that is my only suggestion. Glad you like the banners, I’m so pleased that I’ve finally got them looking like I’d imagined. I definitely agree with you about the ‘J’, it’s just too skinny, I’ll see what I can do with it!